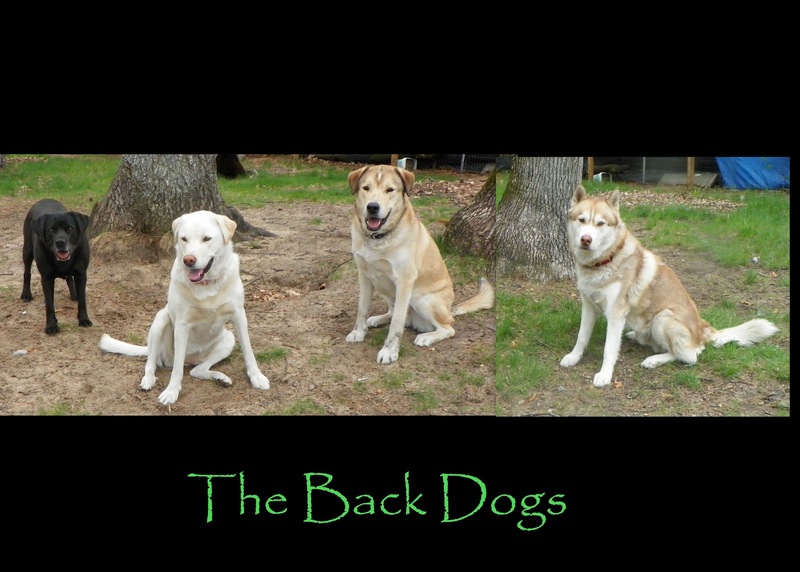 For new readers we have two packs of dogs, the Front pack and the Back pack. 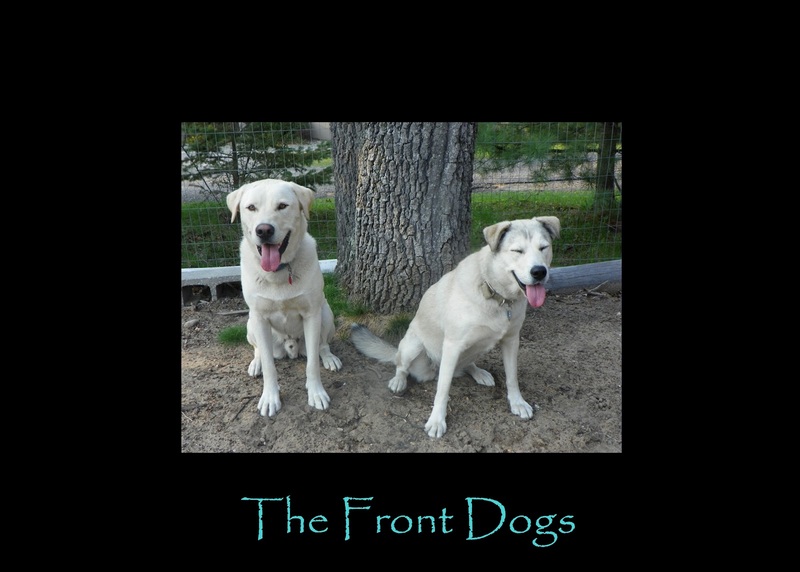 The Front Dogs consist of Chance and Blaze. 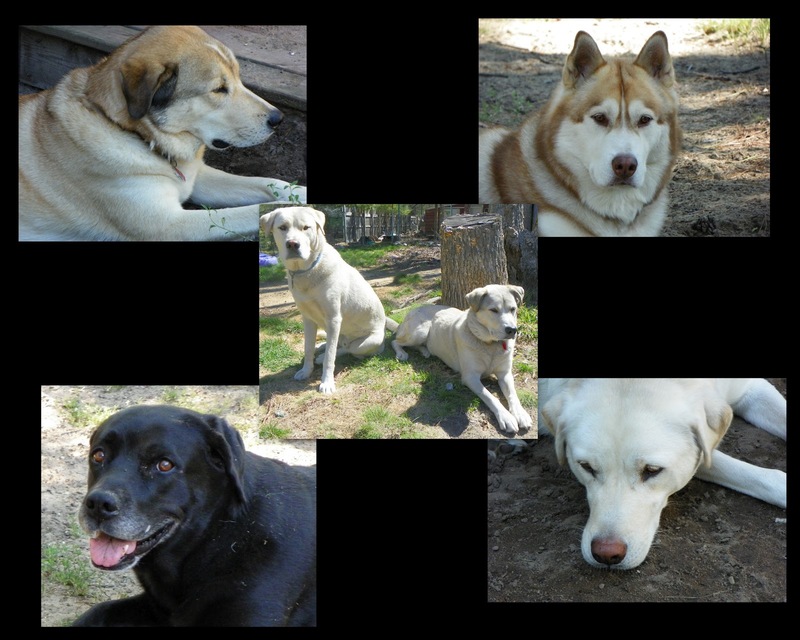 The Back Dogs are Brut, Silver, Fiona and Zappa. We separated them when Chance and Blaze were returned to us (two pups from Brut and Silver's litter) as the Back Dogs wouldn't accept them into their pack. You can read more on the Two Packs HERE. I had a little incident with Brut. It was totally my fault and don't worry, nobody even made contact with each other. It was over food (of course) and I watched how leery Brut got when I got the treats out. He became so edgy and ready to strike which got me thinking later how the Front Dogs (Chance and Blaze) give me an opportunity to see what life is like without a dominant leader hovering over their every presence. While there is only two of them, male and female, they are the leaders of their pack I don't know how they would act with a third or fourth dog 'underneath' them. Between the Front Dogs there is only a slice of food aggression. It does happen on occasion that there is a fight, but it is very rare. Maybe once a year. Chance has been known to push Blaze's buttons many a time during play and again on a rare occasion he pushes too far. Since they are only two dogs and only have each other, I really wonder how they would act with another dog added to their pack once they got past the accepting stage. I don't know. Hard to answer. Because one thing the Front Dogs don't have is Brut. They don't have him controlling them to keep in his line. Chance and Blaze don't have to worry or watch every step they make, like the Back Dogs. The Front Dogs are constantly able to come and go with each other, with only each other to answer to. They essentially have more freedom and less demand, which I think gives them their playfulness with each other. Chance and Blaze are nothing short of playing chase games and bantering with each other. While the Back Dogs under Brut's guise are more conservative and reserved. It is like all the stars have to be aligned to have a game of chase. Or maybe they have just grown out of it. Or maybe there is something else I don't know going on. Since I never had more than three dogs at a time, I've never experienced such a degree of pack mentality like I do with the Back Dogs. It blows my mind sometimes how the Back Dogs can be so relaxed just exploring the backyard or sit and listening to the sounds. There is an air of experience among them and in many ways they have outgrown the Front Dogs mentally. It's something I can't really explain, there's just something different that is collective as they have learned to work together under Brut's throne. Like pulling all the directions of the wind together and upwards. Powerful. One of the best things that happened was when the tarps blew down on the double fence that was blocking the two sets of dogs. My biggest concern was when Blaze went into heat this past summer. I was afraid there would be more fighting between the boys and there wasn't. In fact it went almost unnoticed. Which has help to create a bond between the two packs on a more physical level, seeing each other and interacting together. When Chance and Blaze were playing one time in front of the fence, I saw Fiona do a playbow to them! It was so cool. This past year there has been less threatening barks and more of excitement, play and curiosity. They have never howled outside, but it would be such a joy to see if that ever happened. Slowly we are moving along and moving together. And while I didn't plan it that way, nor did I think we were going to move along so slowly, I wouldn't have it any other way. Each step is a step closer to something I'm still not sure will ever really happen. Merging the two packs. And even as I say that, I still see signs of hope that it will. One paw at time, things will happen in their own time the way they were meant to be. And that is just right with me. You certainly have difficult dynamics. Phew! Maybe as they get older they get more mellow? We agree definitely two different packs. Have a tremendous Thursday. My sister has Bull Mastifs and similar situations. I am amazed at the stories she tells me, and how the pack mentality functions. Great read. I'll be back! I'm so glad you're so patient and loving with all of them, to give them the time to acclimate (or not). Funny how different they are! That must be so very interesting to watch. 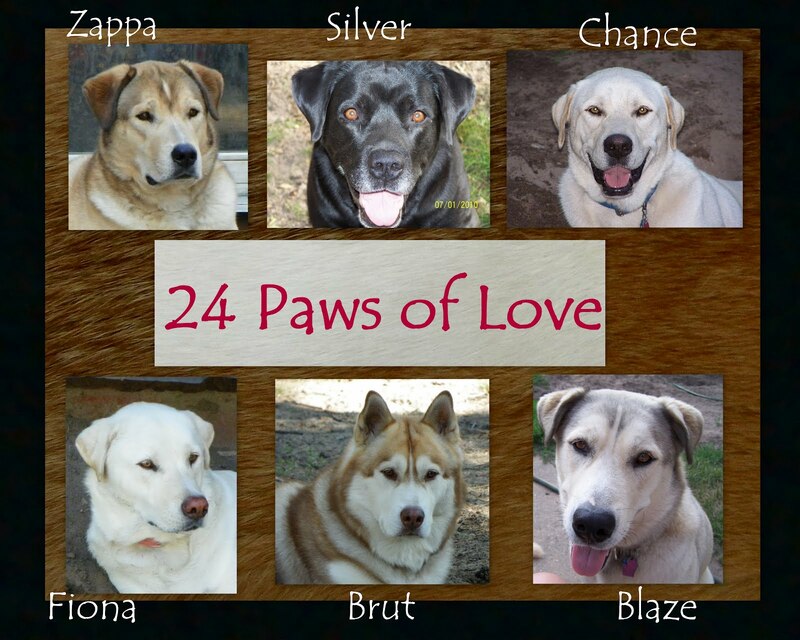 "24 Paws of Love" has been included in the Sites To See for this week. Be assured that I hope this helps to point many new visitors in your direction. Did you know that you can create short links with AdFly and get $$$ from every visit to your short links.